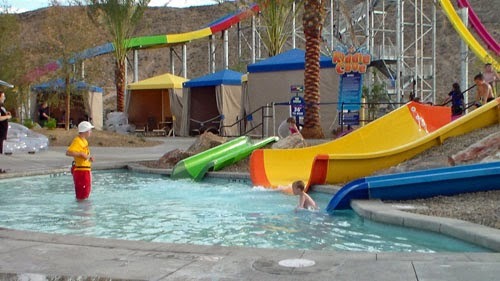 Wet'n'Wild Las Vegas is a 26-acre water park in Summerlin, Spring Valley. The park is part of Village Roadshow Theme Parks' Wet'n'Wild chain of water parks located across the world. The Park offers both male and female shower, restroom and changing facilities to the right of the entrances gates. For your convenience two family restrooms are located adjacent to the main facility. Wet ‘n’ Wild Las Vegas offers two parking lots for guests use. The first is located immediately in front of the Park's main gates. A secondary parking lot is located a short walking distance on the North side of the Park. Visit the park after 4pm and take advantage of extended hours this season with the Twilight Admission for just $19.99. Tornado - The award-winning extreme water slide simulates a natural storm experience, where you start your journey being catapulted from 36 feet in the air through a 110-foot tunnel before plummeting into the eye of the storm. Spin around the Tornado’s funnel in a four person raft where you will sweep up the Tornado’s wall experience weightlessness or zero gravity, splashing back and forth through the menacing, swirling water before being released into the calm shallows below.